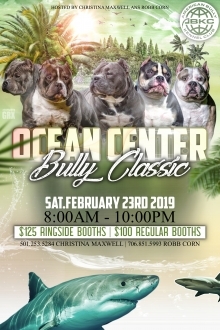 The Ocean Center Bully Classic, ABKC American Bully Kennel Club Dog Show, will be held in the Ocean Center's Arena on Saturday February 23. Doors open at 8:00 a.m. and the show starts at 10:30 a.m. Admission is $20 for adults, children 12 and under are free. For more information go to http://theabkcdogs.org/events/ .